Is social dancing in the clubs becoming boring to you? 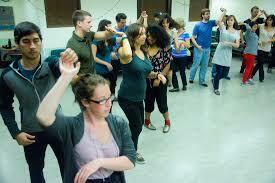 Why not take your dancing to the next level by trying out for a dance group or participating in a dance contest? Leader: The ladies know every dance with you is so much fun — they can get their salsa fix from you in one or two dances. As a leader, your attention is 100% on your partner and the enjoyment of dancing that song together. You’ve mastered the lead so well that it doesn’t matter what level of skill they’re at (beginner, intermediate, advanced) — they know exactly where you want them to be and what moves you are doing without a tug of war; and/or doing crazy moves which forces them to bump into and/or be stepped on by other dancers on a crowded dance floor. Your skill as a dancer is at such a level that you don’t even need a partner for someone to appreciate how you can move on the dance floor (style-wise). You never refuse a dance without good reason and if you promise to dance with them later, you remember your promise. Follower: The leader knows that he’ll have 100% of your attention during the whole dance and you’ll be able to follow whatever move he can give you at a moment’s notice. You don’t try to anticipate or lead yourself and even if you both make mistakes, you can laugh, smile and/or apologize for the mistake (not give him dirty looks). You can execute his every move seamlessly and can add a little spice to his dancing enjoyment by adding your own personality (from ladies styling) into the dance. You don’t refuse and judge the other dancer just by his looks or whether you think he can dance, then go up to him later and ask for a dance when you realize he really does know how to dance. What are your dancing goals?